SJGOV.org - How can we serve you today? Madagascar giant hissing cockroaches can grow up to 3 inches in length. Unlike other cockroaches, these insects do not have wings. They hiss as a defensive reaction to distract predators. The roaches are able to pass air through respiratory openings or spiracles that are located along their abdomen. Only adult roaches are able to hiss. Males also use hissing to compete with other males and to attract females. 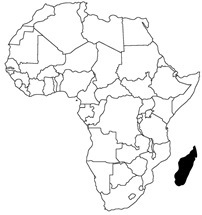 Hissing roaches are endemic to Madagascar, the island in black to the right of Africa.